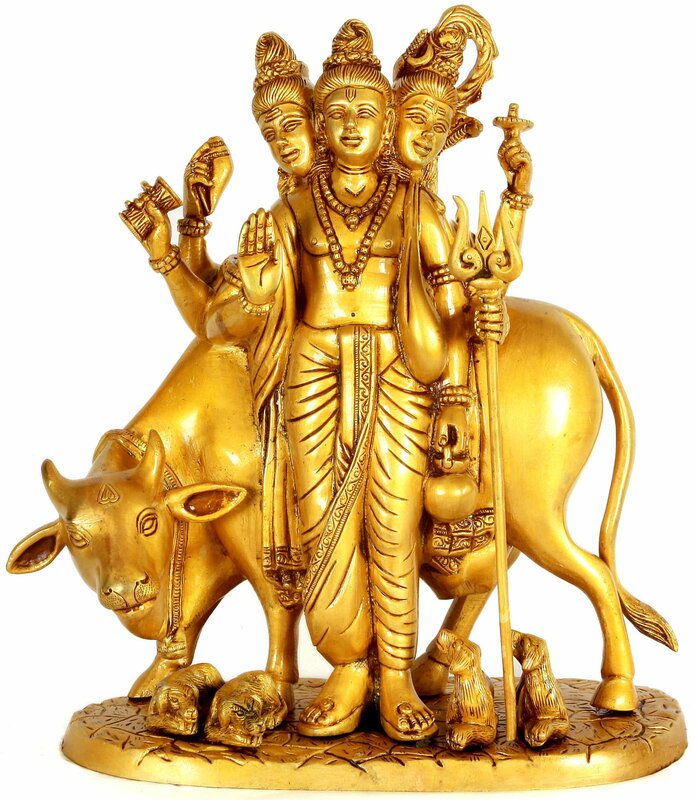 This magnificent brass cast, three-faced and six-armed image, carrying Trinity attributes – in two upper-most Lord Vishnu’s conch and disc, in the middle ones, Shiva’s trident and ‘damaru’ – double drum, and in the normal left, Brahma’s ‘kamandala’ – the pot with a handle, represents saint Dattatreya elevated to a god’s status in his very lifetime and hence known in the devotional tradition as Bhagawan Dattatreya. 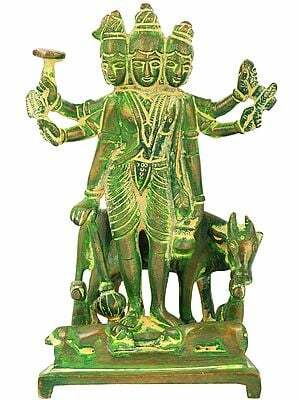 The sixth hand, the normal right and the principal one, held in ‘abhay’ – protection-assuring gesture, is the attribute not only of the Trinity Gods but also the reflection of sublime saintly emotion, divine benevolence and concern for all beings. 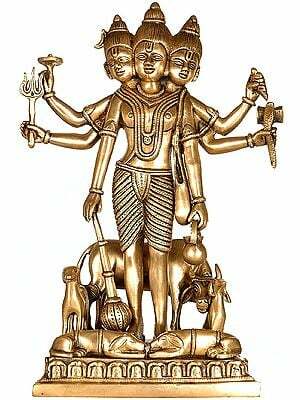 One of the sons of sage Atri by Anasuya, texts revere Dattatreya as one of the incarnations of Lord Vishnu though far above such contention the popular tradition perceives him as incarnating the Great Trinity – the three trinity Gods conjoint, not one of them. Such popular contention is without scriptural support. As the Brahmanda Purana has it, in appreciation of her act of persuading Silavati to take back her curse and allow the sun to rise Brahma, Vishnu and Shiva had conjointly given words to Anasuya that they would take birth from her womb as her sons. The faithful wife, Silavati, by the power of her chastity had commanded the sun not to ever rise. As the tradition prevails, over a dispute Animandavya had cursed Ugrashravas, the husband of Silavati, that with the rise of the sun his head would explode and he would die. Frustrating Animandavya’s curse Silavati commanded the sun not to ever rise. This imperiled the existence of life compelling Brahma, Vishnu and Shiva to make joint effort in persuading Silavati for taking back her command. However, it were by Anasuya’s efforts that Silavati withdrew her decree. 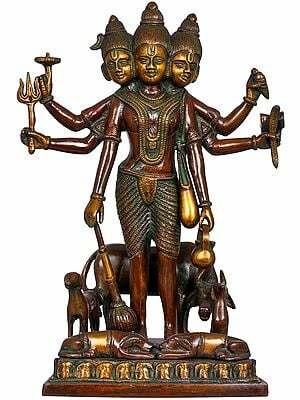 In due course Anasuya gave birth to three sons, Soma believed to incarnate Brahma, Durvasas, Shiva, and Datta or Dattatreya, Vishnu. 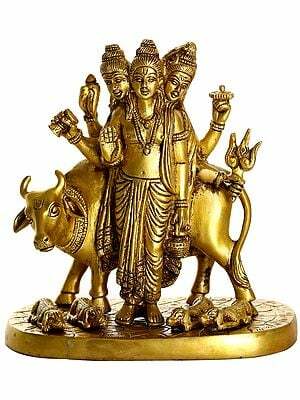 Of the three only Dattatreya had recognition as an incarnation and his two brothers incarnating Shiva and Brahma had to seek the expression of their godhood only in him. 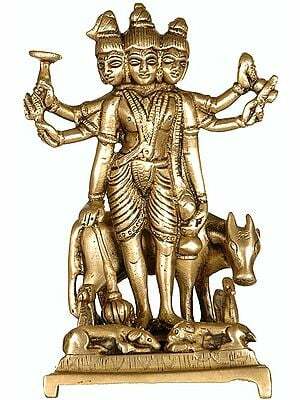 It was such contention that from around the mid-sixteenth century Dattatreya began to have an image form that combined in it the three Trinity Gods that the three sons of Anasuya incarnated. 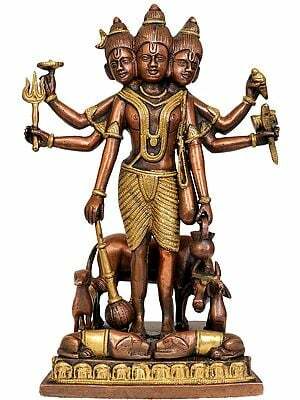 Thus, on one hand the images of Dattatreya represented his own form as incarnating three gods of Great Trinity, and on the other, also Anasuya’s three sons. 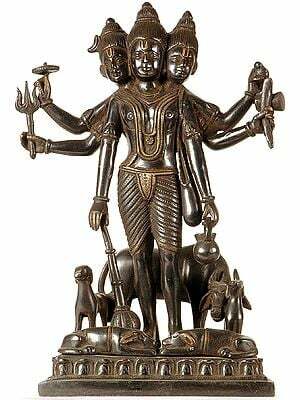 Thus accordingly, the images of Dattatreya are invariably rendered, as here in this statue, with three faces representing Brahma, Vishnu and Shiva and six arms. In this representation the central face represents Lord Vishnu while that on the left, Shiva, and one on the right, Brahma. Of the three figures Shiva’s identity with the third eye – ‘tri-netra, crescent and a snake adorning his ‘jatajuta’ – knotted hair, and river Ganga emerging therefrom, is more elaborately revealed. The identities of Brahma and Vishnu are indicated just by the ritual marks on their foreheads. Besides, with ‘vaijayanti’ – the garland of Parijata flowers on its breast, the anatomy of Bhagawan Dattatreya has been conceived on Vaishnava line. Such divine distinction apart, the figure has hung on its left shoulder a sack such as acolytes carried for collecting alms. The sack denotes the basic state of his being that as a sage’s son Dattatreya essentially was. This humility is further revealed in the form of his ‘antariya’ that he is putting on. Not as gorgeous as that of Lord Vishnu it is a simple textile length with an humble border. Besides, it has not been added with an ‘udar-pata’ – waist-band, or ‘madhya-pata’ – decorative central band. This humility is revealed also in the type of foot-wear and ornaments crafted from simple Rudraksha beads – essentially the attributes of a saint. 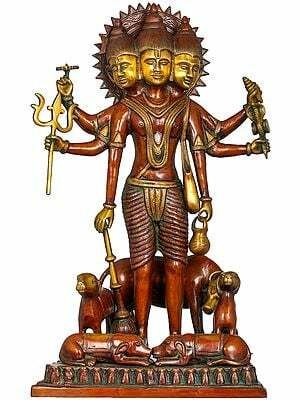 Exactly as prescribed in the iconographic tradition of Dattatreya, this figure consists of three faces representing Vishnu, Shiva and Brahma, and six arms carrying prescribed attributes. 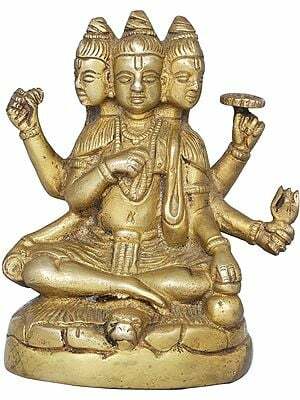 All three faces have almost identical coiffures though enshrining crescent and with river Ganga emerging from it, that of Shiva has a bit different appearance. The image also incorporates the essential attribute of an acolyte, a shoulder-bag carried on his left shoulder and the wooden footwear. 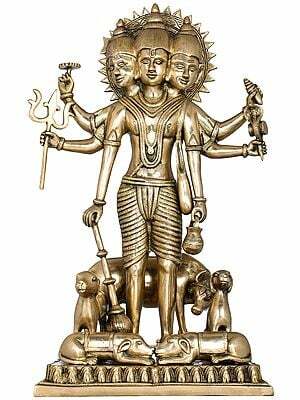 Thus the image combines the Trinity aspect as also that of a sage that as son of sage Atri he essentially was. 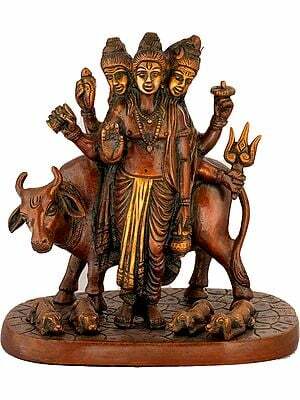 Dattatreya seems to have acquired divine status, especially as one of Vishnu’s incarnations, quite early. The sixth century BC text – the great epic Mahabharata, alludes to Dattatreya’s divine powers. In his poetic narrative Shishupal-vadha, the seventh century AD’s Sanskrit poet Magha again alludes to Dattatreya as the incarnation of Vishnu. 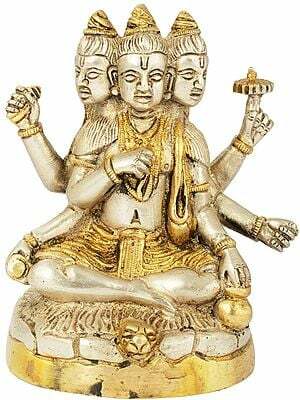 However, Dattatreya attained the ultimate heights of divinity in the mid-sixteenth century when, as acclaims the text Gurucharitra, he emerged in worship tradition as Parabrahma – Transcental God. It was around then that his image form also concretized. It incorporated a cow, symbolic of the earth and the entire space that he protected by his bounty, in the background, and four dogs, two on either side, symbolising the time’s four parts – four eons. The image is outstanding in divine aura and rare quiescence that enshrines it. This description by Dr. Daljeet and Prof. P.C. Jain. 6.5" X 4.3" X 2.5"